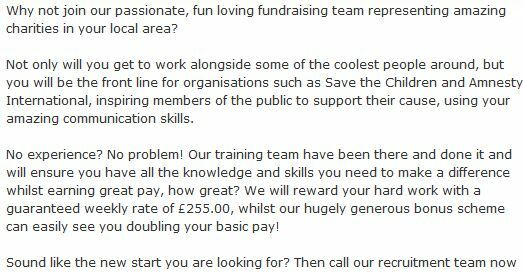 Chugging (or face-to-face fundraising to use the correct term) is something that I dislike as a member of the public, as a fundraising professional, and as a chief officer in the voluntary sector. 1. It makes no money. The only way to make money is to take the donors recruited through chugging and try to extract more money from them later on. This misleads donors into signing up because “its only £3 per month”. It can't be if charities are to make any money from it. Charities pay tens of millions of pounds every year to subcontracted firms who sign people up to direct debits on the street or doorstep and while chuggers, as they have become known, are both loved and loathed in equal measure, the rewards can be plenty: last year 750,000 people signed on the dotted line, giving an average contribution of £90 a year. Figures show smaller charities are increasingly turning to face-to-face fundraising as a way to generate cash in the downturn. According to the Professional Fundraising Regulatory Association (PFRA) - set up by charities to monitor face-to-face fundraising - on average, the companies behind the collections are getting between £80 and £160 per donor they sign up. Mick Aldridge, the PFRA's chief executive said: "Some charities might be paying £50 or £60 per donor, some might be paying £100 or £120 or possibly even more." "It may look to the outsider - to the uninformed outsider - as if all their first-year donation is going to go to a third party but thats not the only way of looking at it," he said. The problem is that chugging is a bit like the emperors new clothes. I am not an uninformed outsider, but because I disagree with it my opinion will no doubt be branded as “uninformed” along with anyone else who points at the naked man striding down the street. The attrition rate (number of donors dropping out) in the first year is very high. Between 33% and 58 % of donors recruited in this way will cancel their direct debit within twelve months. Donors recruited by face-to-face fundraising are dropping off at higher rates than in the recent past, according to the latest figures. The 2009 PFRA Attrition Survey, released today, expects that between 55 and 58 per cent of donors recruited in 2008 via street fundraisers will have cancelled their donation within 12 months. This marks a significant increase from the 2008 Attrition Survey which showed that in 2006 the average street fundraising attrition rate was 49 per cent. “If this trend continues for the rest of the year, we should see doorstep attrition come in at around 44 or 45 per cent, which would represent our best year since we began our analysis, as most years have returned annual attrition levels of 48-50 per cent,” says Rupert Tappin, managing director of Future Fundraising who, along with Morag Fleming of Scottish social care charity Quarriers, co-devised DARS. Although some face-to-face fundraising contractors will provide partial discounts on recruitment costs to compensate charities for donors who drop out their self regulatory body the PFRA is now complaining that other types of fundraising don’t have to publish their attrition rates which makes chugging look bad. This argument is daft. Even if every other type of donor recruitment had equal or worse attrition rates, this would not vindicate chugging. You may be giving £3 per month, but it may be costing £2 to hold your details on a database, process your monthly direct debit and write to you. So why do charities get involved with face-to-face fundraising? Its partly because they feel that all their competitors are doing it and partly because at face value (or presentation) it does look like an "investment", but by the time the true outcomes are known the headquarters fundraising staff who set up these schemes are unlikely to atill be in post. 2. It is a betrayal of the the voluntary sector's values of equality and inclusion. You will never see an old, ugly or disabled chugger. If there are any they are the tiny exception to the rule. 3. Chuggers target the same people over and over again. The people walking down Princes Street and Rose Street are largely the same people every day of the week. Is it any wonder people get fed up being approached by chuggers? 4. It is often aggressive, or persistent beyond the point where I have said no. Last week I was approached by a chugger and put my hand up and said "no thankyou". He pursued me down the street. Yes UNICEF, this was you (and I am not the only person raising specific concerns about UNICEF’s activities in Edinburgh). 5. It makes all charities look bad. 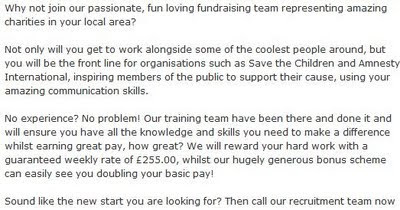 Regardless of whether they do face-to-face fundraising themselves, all charities come out badly from chugging because the only regular contact most people will have with a charity is either going into a charity shop or meeting chuggers. In conclusion, charities survived before the smoke and mirrors of face-to-face fundraising and they would survive if it was banned entirely. The money spent on it would not go unspent in fundraising budgets. It would be for other, less obnoxious, forms of fundraising. Its time that local authorities and the public in general gave chuggers the elbow. Ecalpemos is a blog written in Scotland on issues including current affairs, music, technology and Christianity. Edinburgh City Mission - again! Craighouse Gardens Edinburgh - then and now. This is a personal blog. The opinions expressed here represent my own and not those of my employer. To read the full disclaimer click here.